I could start by saying, "We all have that favorite battleship..." but that'd be a lie. I know plenty of people that can't stand the things. Besides, what is a favorite thing in Eve? For me, many of my favorite things are nothing but my appreciate of the way they look. For others, its all about stats. But this is about my weird tastes. The other day I discussed my liquidation efforts. They are going quite well. I'm narrowing down on just cleaning out items that I don't plan to ever use. I've also started decreasing what I have. I don't need 100 gyrostablizers. If I need more then the 30 I kept, I will get them. But, then I have things like my Bhaalgorn. It has no special story. Snuffbox created a Bhaalgorn doctrine and I greedily purchased one. I've never assembled it. I've never fi it. I'm not attached to it. I'm more excited to have it just to have it because I think its pretty. I've always found Bhaalgorn's stunning. Something about that paint job and the shape of the ship jsut work. Yet, I have absoutly no use for this ship. What to do? Bhaal's like the other pirate battleships used to click on at over a billion ISK. Their price has been trending down and I can take a bit of credit for that's a side effect of getting exploration content opened up. There is a very steady decline from November on in graph after graph. Whoops? Is that accessibility bad? These ships have gone from a billion ISK to under five hundred million. People are flying them more and more. It used to be that undocking one would cause a feeding frenzy for an expensive kill. That almost made pirate battleships useless in some situations. In low sec people would do amazing things to try to land one due to their high value. But lordy, its pretty. I didn't buy one. I couldn't justify it. Then, I had enough ISK and couldn't find a reason for it. Now, I have it and have no need for it and I'm convincing myself to sell it because its useless and in the way and I can get another one later if I need one but I doubt it because I've not needed one for four years already. But I will only keep it in a box in Jita. Maybe think of the Bhaalgorn as equivalent to artwork on your living-room wall? Not everything in the game needs to be purely functional. There should be room for owning things for their aesthetic value, or flying things because to hell with min-maxing, they're just fun. Everyone needs a hanger queen or two. I used to have some until they changed the way ship skins work, now they're workhorses too. Isn't the point of eve to collect pretty ships? If it isn't then I've been playing wrong for over a year now. 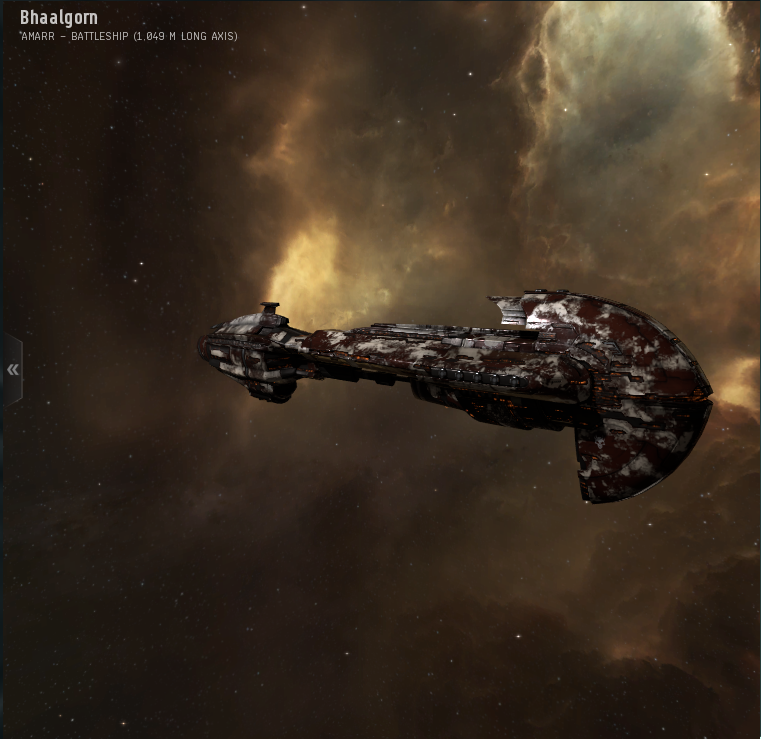 I own a Rorqual for what seems to be the same reason as you having a Bhaalgorn and the Rorq is far less useful. The Bhaal's price decline was affected by both supply and demand sides. The unique role it held as "the neuting battleship" was watered down when Armageddon got the neut range bonus. Players liked the low cost and increased engagement range that offered.